The MPowRx Stop snoring mouthpiece solution is indicated for snorers who have: Full dentures, missing teeth, loose teeth, periodontal disease, CPAP intolerance or TMJ (jaw joint pain). MPowRx has developed a patented state-of-the-art mouth guard to eliminate snoring and mild to moderate Obstructive Sleep Apnea (OSA). Developed by a dentist-medical researcher in a lab with a team of sleep experts, the device has been proven to offer fast, effective relief for snorers, sleep apnea sufferers and their partners. 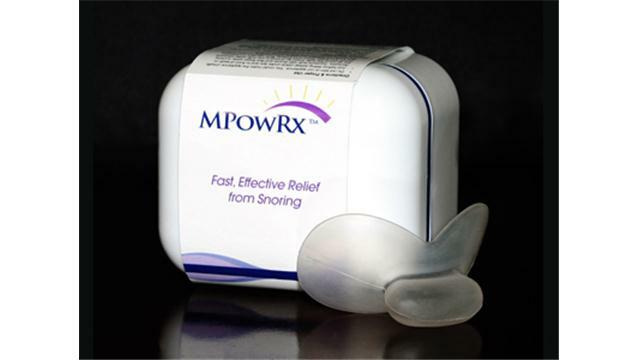 The MPowRx is a prescription (Rx) appliance regulated by the FDA and is intended to be used for simple snoring. To receive you appliance you must qualify by answering a brief questionnaire which will help determine, if you have Obstructive Sleep Apnea (OSA) or just simple snoring. If the results indicate that you have OSA, you should get advice from a physician who can prescribe the mouthpiece for you to help with your OSA and snoring. Many people with OSA are CPAP intolerant and want to use a mouthpiece for their treatment instead of the cumbersome face mask devices. The MouthGuard Store can fill your prescription for this sleep apnea stop snoring mouthpiece. Simply upload a copy of your Rx from your doctor in the “add to cart” section and our doctor will verify your Rx, send you an order code, then you complete your order. The MPowRX™ Snoring Solution is a one size fits all oral appliance which is unlike other snoring treatments because it doesn't require fitting by a dentist. The appliance is inexpensive and easy to use and can be easily inserted before bed and comfortably worn throughout the night in order to get a good, solid sleep. Step 1: Just before falling asleep place flange between lips and front teeth or denture or gums if you do not wear your denture during sleep. Step 2: Squeeze bulb with thumb and first finger while sucking the air out of the bulb. Step 3: Insert tip of tongue into bulb while releasing thumb and finger. Step 5: In the morning, gently squeeze the bulb and remove your tongue. Note: The Bulb should protrude from the mouth slightly. You may experience minor side effects, such as excess saliva or tender tongue, however, these should resolve spontaneously. It is returned within 30 days from receipt. You must include your invoice or invoice number from your e-mail receipt. You are responsible for shipping costs. Very uncomfotable. Comes off during night. Doesn't work. Don't purchase. Just wanted to say thank you - IT WORKS! Four Nights now and no snoring. My husband is estactic and I feel more rested...at last!"